Hello guys. Its been a while but I am back with some brand new ICO projects which I will be reviewing. Alright, before I start the review, I will give a background to the REPU project. It’s 2018 and social media is growing at the warp speed. 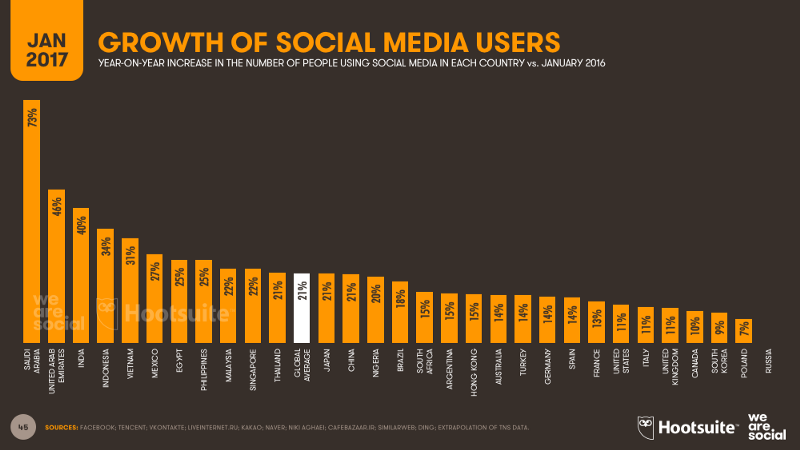 With more and more people joining social media sites and using them regularly/efficiently, the social media industry is bound to become bigger in the coming years. It’s booming like never before. By giving your business brand the social media touch, you not only generate more business but also connect with your customers better and serve them on a higher level. It actually makes your online marketing easier. Social media with all the advantages it possesses may not be suited to every business. If you are unprepared and launch your social media presence without proper planning, you could waste valuable time and money. If you don’t actively manage your social media presence, you may not see any real benefits. SO WHY IS REPU HERE? 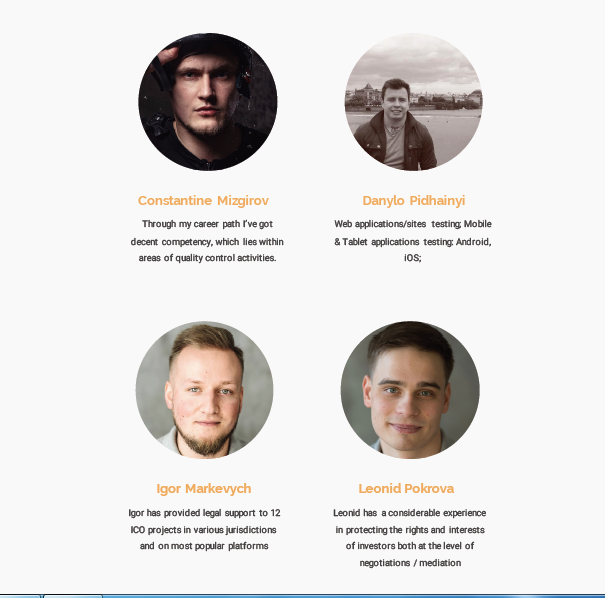 Repu is here to help company’s manage their reputation and also help users rate services provided by companies using Smart Contract and Block chain technology. The REPU system (shortened from English meaning — reputation) is a revolutionary project that allows you to completely rethink the way social networks are perceived. REPU is a rating and feedback system based on decentralized blockchain technology. Technology allows you to completely replace the system of “likes” with the rating — both for users and for companies. The rating, subsequently, can be used as an assessment tool in various areas of the individual’s life — starting with professional skills, financial stability, and ending with all possible aspects of behavior and interaction with the public. REPU is an application that allows its users (ordinary citizens, companies, employers, recruiters, government officials, law enforcement officials, etc.) to use the rating and feedback system in everyday life. The platform is being developed as a separate project, which in the future is planned to be integrated into social networks (facebook, Vk.com, Youtube, Instagram, LinkedIn, Snapchat) and replace the existing system of “likes”. Ratings and feedbacks will function through the decentralized blockchain technology and smart contract. 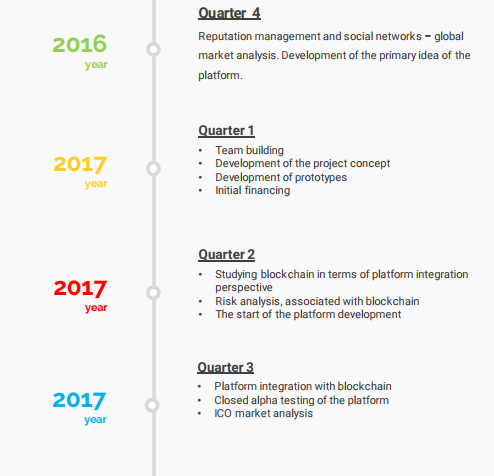 Repu’s Mission is to change the way of perception and interaction among social network users, through the use of the rating system, as well as the way of managing the company’s reputation, by obtaining real business ratings from users. An important objective is also the possibility of assessing a person in terms of professional qualities for the subsequent employment. This eliminates the subjective opinion of the recruiter and the impact of the resume on employment. Rating Insurance companies — Very many of us have one form of insurance or another. Some of us have mortgage insurances, vehicle insurance, health insurance schemes to mention a few. When you make use of the insurance services of an Insurance provider, you can rate these insurance companies depending on how well you liked their services. With these ratings, you can adjust the size of insurance payments. Rating Banks — Services provided by banks can be rated. For examples ATM services, Online banking experiences can be rated. These ratings by clients can adjust the credit rating, based on values from the REPU system. Rating Recruiters — an individual’s assessment in terms of professional skills, as well as social adaptation. Law enforcement agencies — an individual’s assessment (rating) in terms of danger to society. Ordinary citizens — After you meet someone when making new acquaintances, you can rate your experience when you met them. Are they friendly or harsh, do they talk alot or are a little reserved. So what happens after I rate these companies? There are several immerse benefits involved in rating these companies which I will discuss. Recall that this system of rating benefits both Companies and Clients. It allows clients to evaluate any product up to a specific model / modification. Evaluate any service — up to an individual employee who was consulting the user and / or was providing the service. Recieve rewards for providing feedbacks: On many occasions, most feedbacks are given by clients who didn’t have a good experience with the company. Except off course these feedbacks are made compulsory in one way or another. To make users more interested in giving feedback to companies which will help them improve their services, rewards are introduced. It receives feedback about any products of the company, services, employees, etc. In the future, it makes it possible to improve the product / test individual services / niches — to receive feedback from real users. Test and offer users to rate and evaluate new products before launching into the market Thus, from the economic standpoint, owners save considerable amount of money he could have incured as losses and use excess gains to reward clients for their help through feedbacks. Now it is necessary for us to understand that to grow and improve in what we do, we must have feedback from users of our products. This allows Service providers to improve and grow their businesses. This is the platform were comments, rating and feedbacks about different products will be giving by clients and received by Companies/Service providers. Furthermore, it is planned to integrate the platform with existing social networks — Facebook, Vk.com, Instagram. Providing rating (scores) instead of “likes” for social content. Thus, the end user receives a new tool for assessing his/her livelihood, instead of the traditional number of subscribers. Providing ratings and feedbacks about companies (banks, restaurants, airlines, insurance companies, cars, shops, shopping centers, etc. ), as well as about their specific employees (by means of identification through the application on the smartphone). Managing the company’s reputation for its owners. In addition to the traditional work with customer feedback, managers clearly see the “weak spots” within the company, through the ratings of specific employees and departments, in general. This allows you to see the complete situation in the company as a whole and to influence it. Professional rating for recruiters — in addition to the traditional (social) rating of a particular user, a professional rating from clients is also introduced. Thus, when hiring, the recruiter, clearly sees the history of the applicant and can make a decision. Blockchain technology eliminates the possibility of forgery / deletion of reviews and ratings. The rating system is designed to make a better world — this will force users to strive to create better content, be more sociable in everyday life, grow in terms professional qualities — all this, in an aftermath, can have an effect over his/her life and save money. The REPU application will make use of REPU Token in rewarding clients who give feedbacks. REPU Token is a digital token called RepuCoin. It is a virtual currency that is used inside the platform to pay for the company’s reputation management services (monthly, quarterly, half year and annual subscriptions), rewarding users for ratings, and for internal payments for goods / services within the REPU infrastructure. RepuCoin is a cryptocurrency, which is awarded to users who provide ratings within the system. RepuCoins are automatically generated by the REPU smart contract only when a company pays for reputation management services with its own means, so they are not being taken out of nowhere. Therefore, there will be no surplus of tokens on the market. RepuCoins are always secured by other currencies. REPU tokens are created on the basis of Ethereum ERC-20. At the moment, we are working on technical description and specification of smart contracts. Information and open source code will be added later on. 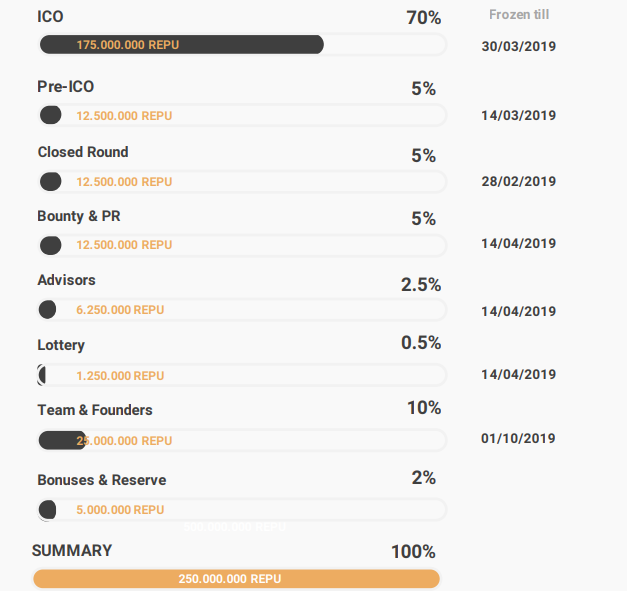 The REPU issue is limited to 250,000,000 REPU during the closed round, pre-ICO and ICO. Undistributed REPU that were issued for sale during the closed round, pre-ICO and ICO, will be frozen on the smart contract without the possibility of subsequent withdrawal or use (destroyed actually). The REPU issuance is programmed by a smart contract. What can I use RepuCoins for? payment from companies for services. Another possible use of tokens is purchasing exclusive offers from companies. 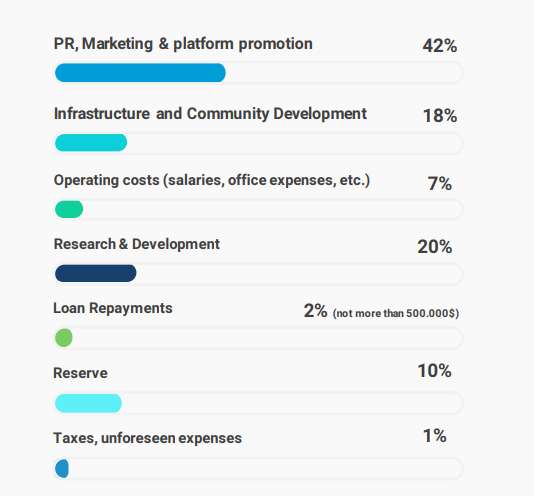 The funds will be spent on preparing Pre-ICO and ICO. • HardCap — 1800 ETH. 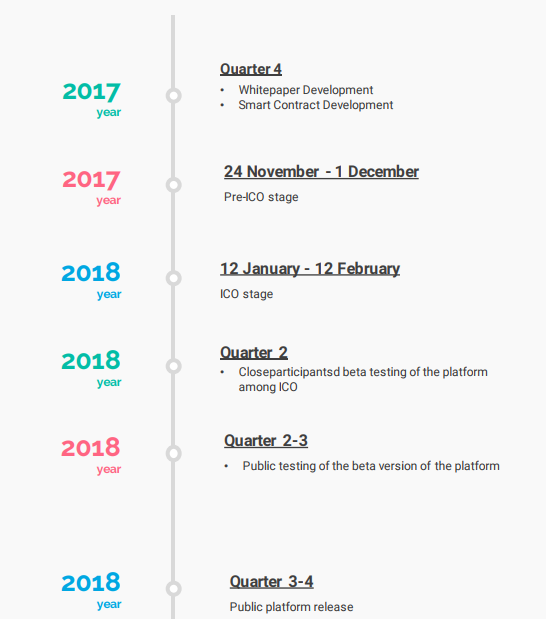 The funds will be spent on preparation and marketing of the ICO stage. Well guys I have come to the end of this review. There are many more information you can find in the links given below. Please make sure to check these links out and make sure to follow my page so that you can get latest review update.